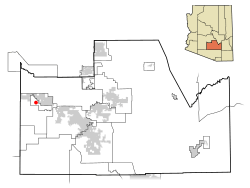 The Ak Chin Indian Community of the Maricopa (Ak-Chin) Indian Reservation is a Native American community located in the Santa Cruz Valley in Pinal County, Arizona, 37 miles south of Phoenix and near the City of Maricopa. The Community is composed mainly of Akimel O'odham and Tohono O'odham, as well as some Hia-Ced O'odham members. The reservation was established by the federal government in 1912, under President William Howard Taft; within a few months his administration reduced it by more than half, due to opposition from non-Native farmers in the area. Gaining federal recognition in 1961, the tribe has established a large agricultural operation, aided by gaining water rights to the Colorado River in a 1984 federal settlement. The Community opened a gaming casino in 1994, Harrah's Ak-Chin Casino, with related hotel facilities. In 2011 the casino and resort was the major contributor to the economy of Pinal County. In July 2011, the casino underwent a $20 million expansion, with addition of a new 152-room hotel tower that doubled its capacity. The resort now has 300 rooms, and an outdoor swimming pool, completed in 2012. The resort features five restaurants, an entertainment venue, meeting and conference space, and the only bingo hall in the Caesars organization. In 2006, the Ak-Chin Indian Community purchased the Phoenix Regional Airport, which was later renamed Ak-Chin Regional Airport. Located near the Santa Cruz Commerce Center, the 170-acre Ak-Chin Regional Airport consists of an airport building with a 5,000 ft. runway . In April 2012, The Community opened the new Vekol Market, which includes a deli, a wide selection of groceries, culturally indigenous foods, a café, a patio with outside seating, and space for a farmer’s market . On November 14, 2012, The Community opened UltraStar Multi-Tainment Center at Ak-Chin Circle. The center features a state-of-the-art movie theater, arcade games, bowling, laser tag and multiple dining options. The Maricopa Reservation was established by the federal government in 1912, under President William Howard Taft, at 47,600 acres (193 km2) in size. Within months the administration submitted to opposition from farmers and other non-Natives and reduced the reservation to 22,000 acres (89 km2). The reservation is located in Pinal County within the Sonoran Desert, about 40 miles south of Phoenix and next to Maricopa. Averaging an elevation of 1,186 feet (361 m), the reservation is located 37 miles (60 km) south of Phoenix. Much of the land is good for farming, and 15,000 acres (6,100 ha) are under irrigation. As of the 2000 census, the population living in the community was 742, with a median age of 24.2, compared to a median age of 37.1 for all of Pinal County. According to the census 89.4% of the population identified as American Indian, alone or in combination with other races. Most of the population lives in Ak-Chin Village, in the western part of the reservation. Part of the city of Maricopa also lies within reservation territory. The Ak-Chin Indian Community has its own written form of the O'odham language. It is in the Piman group of the Uto-Aztecan language family. The name Ak-Chin is itself an O'odham word that means the "mouth of the arroyo." Ak-Chin Indian Community Facts for Kids. Kiddle Encyclopedia.